Mosaic is an annual language arts program for middle school students to showcase their creative talents and express their cultural identities. 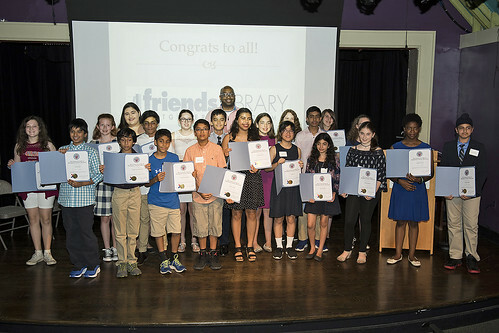 The program is held in partnership with Montgomery County Public Schools (MCPS) and Montgomery County Public Libraries (MCPL). Entries are in the category of essay, short story, or poem (including a spoken word or written version of a rap) and allow students to creatively express their personal reflections on diversity and culture. The keynote speaker for the Awards Ceremony will be Elizabeth Acevedo, whose first book The Poet X is long-listed for several prizes, including the National Book Award and Kirkus. Ms. Acevedo will also be writing the Forward for the anthology. Contact mosaic@folmc.org for more information.